Find pass-a-long plants that your Grandparents may have grown and shared. These are proven perennials, trees, shrubs, and vines that have been grown and shared in gardens for over 100 years! Amplissimus Rose of Sharon produces 2-3" wide, double, purplish-red flowers throughout much of summer on this easy to grow vigorous shrub, which is very tolerant of heat and most growing conditions. Althea or Rose of Sharon is a hardy Hibiscus that naturally develops into a multi-stemmed, vase-shaped deciduous shrub that can be trained into a tree form if desired. Provide an average moist to moderately moist, fertile soil and full sun for optimum growth and flowering. Item# 10338. 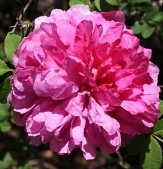 The fully double roses of Archduke Charles are initially dark pink to red on the outer portions of the flower and are rosy pink in the center, with age the entire flower changes to red creating a bouquet of both red and red and pink flowers. The plant has an upright to spreading growth habit that is suitable for use as a specimen or as a free-flowering low maintenance hedge. Like Craimoisi Superieur but with a more compact habit and the same solid disease resistant disposition. Item# 10169. 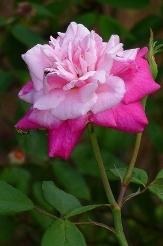 An heirloom variety with 6" salmon-pink, star-like blooms with a dark throat. 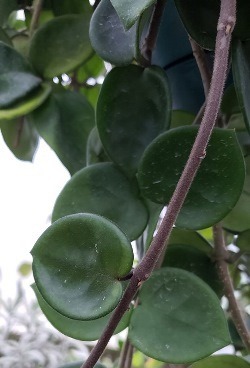 An easily grown cactus-like plant with 1.5" wide, flat, scalloped branches to 8'. Great in hanging baskets. Item# 1069. 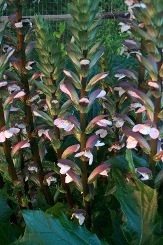 An heirloom variety with 6" salmon-pink, star-like blooms with a dark throat. An easily grown cactus-like plant with 1.5" wide, flat, scalloped branches to 8'. Great in hanging baskets. Item# 9467. 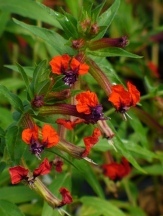 This is the selection with the deepest red color, comes from seed collected in southern Baja California. It flowers all summer and fall. It dies to the ground in winter, but faithfully returns from the ground each spring. An easy to grow and drought tolerant heirloom plant. A bee-keepers pollen favorite, we are told! Item # 9027. The Banana Magnolia produces a multitude of intoxicatingly fragrant, creamy yellow, cup shaped, miniature Magnolia flowers that smell like sweet bananas. 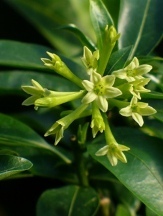 This is an easy to grow, long-lived, heirloom, evergreen shrub with a naturally upright to rounded habit and rich dark green glossy foliage. 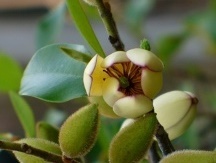 The Banana Magnolia can be used as a large specimen shrub, background shrub, hedge, screen, espalier, or is easily trained into a small single or multi-trunked tree. It has a moderate rate of growth when young and when grown under good or better conditions. Even young Banana Magnolia plants generally flower well under average conditions and they can be grown as container plants for many years with proper care. Item# 975. The sweet dark figs of Mission are the number one favorite for drying. 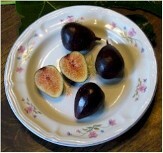 Mission is one of the most widely grown figs in California producing heavy crops of medium to large dark purplish-black pear-shaped fruit with a rich, sweet strawberry red pulp. Good fresh or preserved. Black Mission is self-pollinating and may produce a light breba crop. A good choice for the South as well. The small eye makes it resistant to spoiling. Item # 832. 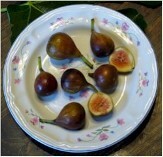 Brown Turkey is the ultimate Southern fig producing large crops of medium to large, brown to maroon, turbinate figs over a long season that begins in June. The flesh is strawberry red and is sweet with good flavor. This is probably the most reliable and commonly grown fig in Southern regions but it is the standard bearer for hardiness tolerating the climate of zone 5. It is known to fruit if frozen to the ground as well. Resistant to spoiling and splitting and good fresh, dried, or preserved. Self pollinating and with a small but open eye. Item# 920. Tall candles to 18" high that are composed of golden yellow blossoms and buds rise well above the foliage of this popular pass along plant from mid to late summer well into fall for an outstanding show. The Candlestick plant is a moderately fast growing and vigorous sun loving tropical that is excellent for the back of the border. Attracts butterflies as well as serves as a host to Sulphur butterfly caterpillars. Reseeds readily. Item# 10017. Medium to large somewhat spidery trumpets are white with a glowing pink stripe down the center of each petal. 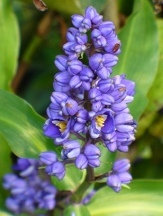 The large clusters of flowers are held on sturdy stalks above the medium green strap-like foliage. This beautiful Crinum hybrid is suspected to be a Thad Howard cross. Item# 3142. 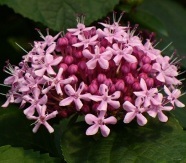 Sweetly fragrant, 6" deep pink bloom clusters are borne atop the dark glossy green heart-shaped foliage. Item # 354. Huge, rounded, white Hydrangea-like flowers are borne in early spring and last for several weeks. The color show starts with small rounded clusters of apple-green buds and so the Chinese Snowball Bush entertains us for weeks in anticipation of spring. Mature plants will often produce flowers in late summer as well although the best show is typically in spring. These are easy to grow large shrubs with a medium to fast rate of growth and a naturally upright to vase shaped habit when young eventually growing as wide as high once mature. 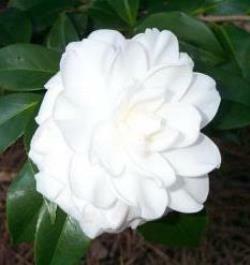 Chinese Snowball Bush was selected as a 2006 Georgia Gold Medal Winner! The huge flowers make excellent long lasting cut flowers for a vase as well. Item# 10362. Dark yellow upward facing, to 2" wide, starry cupped flowers are born in profusion atop the dark green, narrow, rush-like foliage beginning in late summer and lasting into fall. 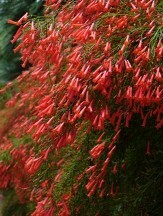 An easily grown Mexican native bulbous perennial that multiplies freely by seeds and offsets. 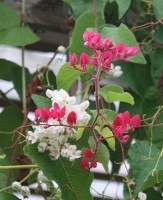 A durable low maintenance plant for the front of the garden, along walks, or for naturalizing. Multiple plants per pot. Item# 9874.